Gutters channel water away from your home and ward of damage to your siding, fascia, foundation, and landscape. Because water damage is one of the biggest threats to your home’s structural integrity, a properly functioning gutter system is crucial. 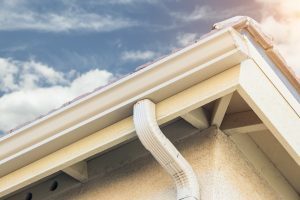 If age and wear prevent your gutters from operating as they should, turn to Tight Line Exteriors to have them replaced. We’re a top-rated exterior remodeling contractor that has been helping Atlanta homeowners update their properties since 2004 and are proud to be a trusted resource in the community. Plus, our gutter systems are available in three different sizes and 21 beautiful colors, so you’re sure to find a look you love. Our seamless gutters provide the ultimate protection against clogs – we even back them with a lifetime no-clog guarantee. However, we also install top-quality gutter guards, which will prevent debris from falling into your gutters in the first place. With gutter protection in place, leaves, twigs, and pine needles will be kept at bay, leaving your gutters clear and allowing water to flow easily. This virtually eliminates the need for maintenance and means that you will never have to spend another afternoon wavering on a ladder while you dig wet leaves out of your gutters. Contact Tight Line Exteriors today to learn more about our seamless aluminum gutter systems. We offer gutter installation services to homeowners throughout the Atlanta, Georgia, area, and would be happy to provide you with a free estimate. At Tight Line Exteriors, quality is everything. We pay attention to the finest details and work with careful precision to ensure your exterior remodeling experience exceeds all of your expectations. © 2019 Tight Line Exteriors | All rights reserved.